In my whole life there is probably only two people who, when being in the presence of them have exuded greatness. Just two people who very obviously were living legends. It was plain to see. Undeniable. There was about them an undefinable quality. Something rare, unspoken, and very special. One was Joe Strummer of The Clash; the other was Johnny Cash. I was always a fan of The Clash and was lucky enough to have seen them when I was very young, even getting to go backstage to meet them. It wasn't, however, until I saw Joe Strummer during the Class War Rock Against The Rich tour in whatever year it was that I suddenly realised how much of a living legend Joe was. As I said, he exuded greatness. He had 'it'. As for Johnny Cash, he's always been legendary but it wasn't until I saw him at Glastonbury festival that I realised just how iconic he was. I used to work at the festival and would see a lot of the bands backstage, and though a lot of them were 'stars' I was never awestruck by any of them - until Johnny came along. There was something about him; in the way he walked, the way he held himself and the way he spoke. Here was a very modest man who was from a different age but still very much relevant to the present. He had survived where so many others had not. He carried with him a grand and very heavy sense of history and when he strode out onto the stage and said "Hello, my name's Johnny Cash", he brought forth all that same history into one single, live moment. Both Joe Strummer and Johnny Cash were very much one-off, unique figures and their like will probably never be seen again. To attempt to emulate them would be a futile task and there have been quite a few people who have tried. Ultimately, the greatest honour to be paid to them both would be to have them as inspirations and an influence but then to go your own way, live your own life and sing your own sings. That's not to say, however, that their songs can't be covered. There's been some very good covers of Clash songs over the years and one of my favourite albums is, in fact, a tribute album to Johnny Cash entitled Til Things Are Brighter featuring the likes of Marc Almond, Michelle Shocked, the Mekons, Marc Riley, and Mary Mary of Gaye Bykers On Acid. 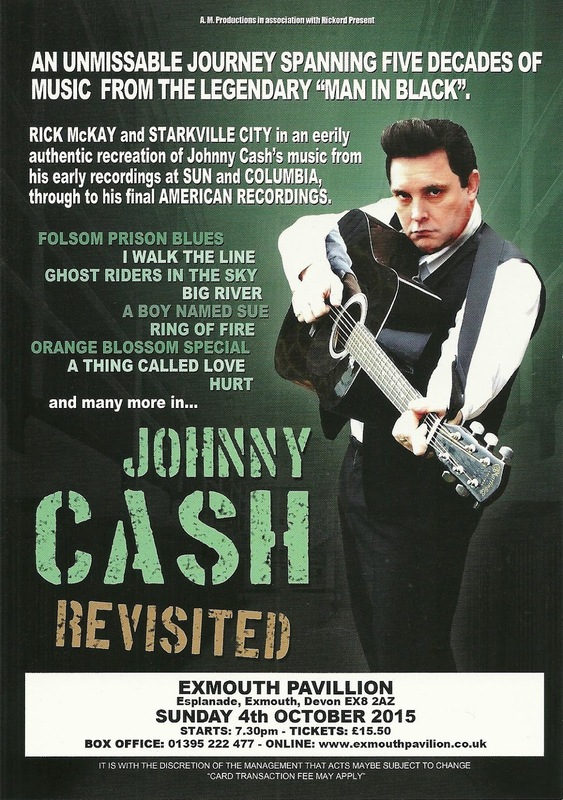 Playing in Exmouth this weekend is Johnny Cash Revisited, "an unmissable journey spanning five decades of music from the legendary 'man in black'." Purists might scoff but even if it's merely a pale shadow of an imitation of a copy, how can you really go wrong with songs of such quality? See y'all there, cowboys and aliens. Yeehaw! Johnny Cash - his like will never be seen again. You were so lucky to get to see him up-close. Guilty pleasure? Why so? Genius. Guilty pleasure as in admitting to liking that which the terminally hip might view as being naff: Neil Diamond, Alvin Stardust, Boney M, Sigue Sigue Sputnik, etc, and the kind of covers band to be usually found playing on a wet Tuesday evening at a Butlins holiday camp. So in regard to Johnny Cash, not the great man himself but a pale shadow of an imitation of him playing on a wet Sunday evening in Exmouth. I remember you writing somewhere that one of your bugbears was people not admitting to all their likes and influences and only listing what might be 'hip'. I'm with you on that one.